The church is divided into three groups of people: the church triumphant which refers to the saints in heaven, the church militant which refers to Christians who are still alive struggling for their salvation, and the suffering church which means those in the state of purgatory undergoing purification before going to heaven. In our profession of faith, we often say that we ‘’believe in the communion of the saints, the forgiveness of sins, the resurrection of the body, and life everlasting. Amen.’’ Today’s celebration is a demonstration of our belief in the communion of the saints both the living and the dead which includes all the three groups. The saints are our brothers and sisters in the big family of God. Today and throughout this month we shall be celebrating their collective birthdays and memorials as members of our family. For the church triumphant we are celebrating their success and joy in heaven where we hope to be some day and we are also asking them to intercede on our behalf for the graces we need to succeed in our struggles like them and enter heaven. For the suffering church we pray that God should have mercy on them and forgive them their sins so that they can enter heaven like the saints. The suffering church members cannot pray for themselves, so they need our prayers before they are release from purgatory, the place of purification, to heaven where they will in turn intercede for us together with other saints there. 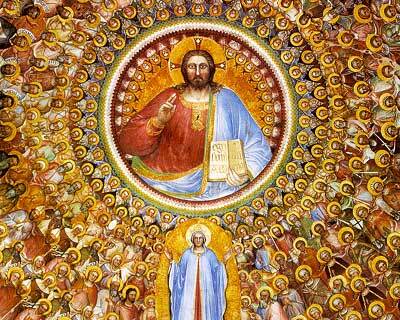 All the readings of today explained the how and glories of becoming saints here on earth and in God’s kingdom. These readings talked about the kind of great joy and peace that characterized the lives of the saints in heaven. We begin to experience this joy and peace here on earth and we are sure of much more of it eventually in heaven. Therefore, we have every reason to celebrate and be joyful because we are children of God with right of inheritance to the kingdom of God. As Christians we are sure of joining the saints in heaven one day. In the first reading, John described his vision of the servants of God marked on their foreheads that came from different tribes from all over the world wearing white robes and carrying palm branches and crying out loud in worship to God the most high. He said the saints are those who survived great distress and have washed their robes and made them clean with the blood of the lamb. This means to be in communion with God is to be pure like him. This is the kind of heavenly vision of glory that we need to keep in mind as Christians to help us remain in the path to heaven. The psalm of today tells us that right from the beginning God design man to seek his face which is the only way to true happiness. And to qualify to be in communion with God means to long to be like him (who can ascend the mountain of the lord? Or who may stand in his holy place? The person who can do this is one whose hands are sinless, whose heart is clean, who desires not what is vain). In the gospel, this is the kind of life Jesus taught his disciples- how happy and blessed they are if they lived their lives according to his beatitude. The beatitude include: being poor in spirit, mourning for our sins, gentleness of lifestyle, hunger for and thirst for righteousness, merciful lifestyle, pure and peaceful at heart, and suffering insult and persecution for your faith in Christ Jesus. In the beatitude Jesus taught his disciples that true happiness in this life is found only in living out the beatitude. St. Paul in the second reading said that we are blessed to be call children of God with right of inheritance in the kingdom of God. And that the world hates us because the world does not know God. The Christian life is foolishness to the worldly people. But that we should not be worried about that, rather be concern about what we shall become in heaven; we shall become like him and see him as he really is. However, we must make ourselves pure before we can become like him. The celebration of the saints today reminds us of the fact that so many other people have lived the beatitudes and succeeding in going to heaven. The saints endured so many pains, persecutions, struggles, and humiliation but they are joyful and happy now in heaven. Yes, the world will be against us and the truth that we stand for, but like the saints, we shall be happy if we endure to the end.